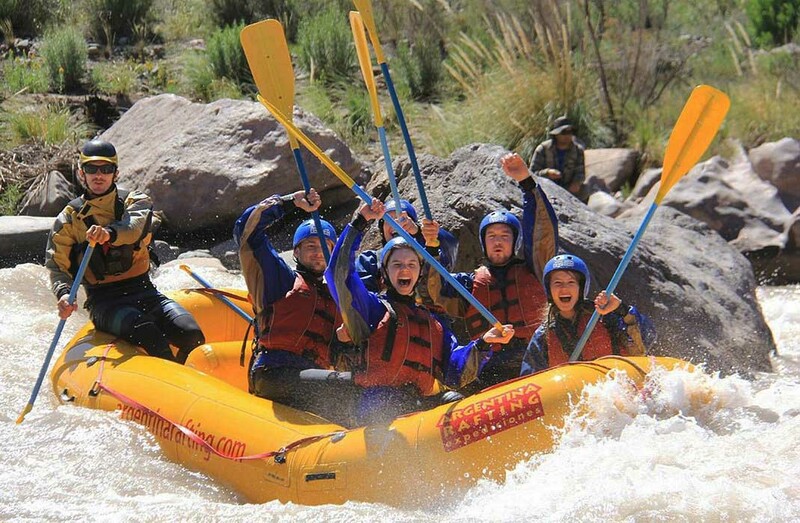 Get ready for a heart-pumping, whitewater rafting experience on the Mendoza River! 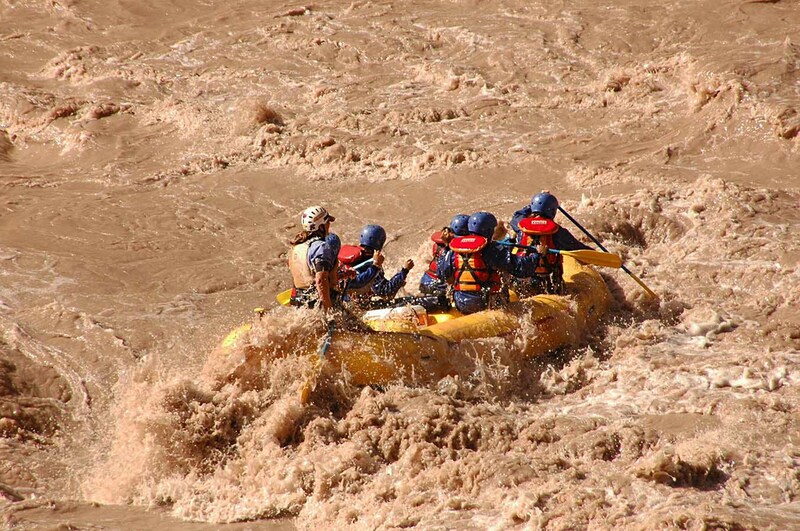 Bring out the intrepid traveler in you, and get ready for a heart-pumping rafting experience on the Mendoza River! 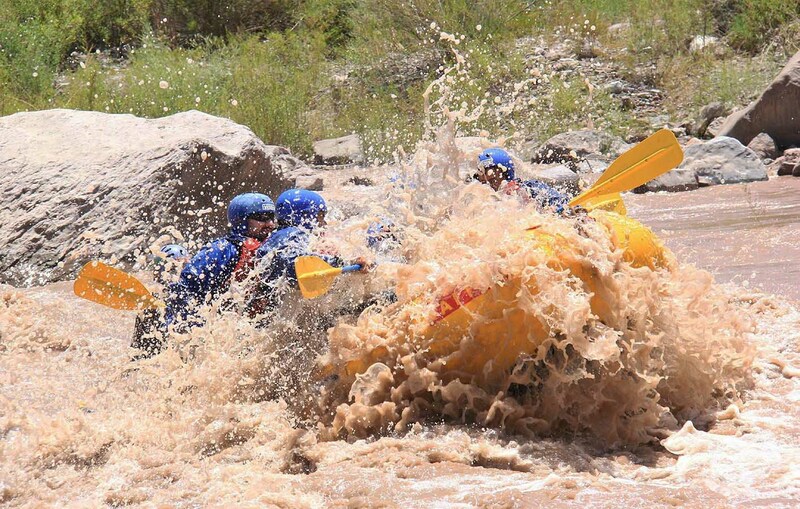 With a difficulty rating of moderate, and with the anticipation of taking on Class III and IV rapids, there’s no shortage of excitement on this rafting experience. And with all of the pristine melt-water flowing down from the Andes Mountains, providing an ample amount of intense whitewater, you’ll have plenty of thrills to fuel your adventurous spirit. Our rafting outing starts off with a morning pickup, as we head to the rafting base, on the shores of the Mendoza River. Once there, we’ll be given a brief course on rafting as well as a security talk to prepare us for our upcoming adventure. Next will time to put on our gear, grab our oars, and hop on board our rafts! Our rafting route will traverse 7.5 miles (12 kilometers) as we head down the Mendoza River. Our experienced guide will always be in the raft with us, and a support kayak will follow, providing you with security as you enjoy your rafting adventure. The entire experience will last for approximately 60 minutes, and will include rough Class III to Class IV rapids (depending on the season and the river level, rapids can also be Class II+), so get ready to get wet and feel the adrenaline rush as you conquer Mendoza’s intense rapids! 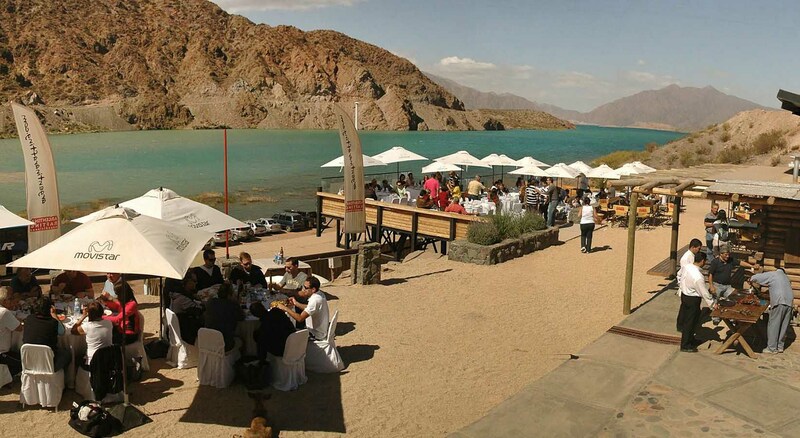 After the tour, we’ll enjoy some lunch at our base next to the Mendoza River. 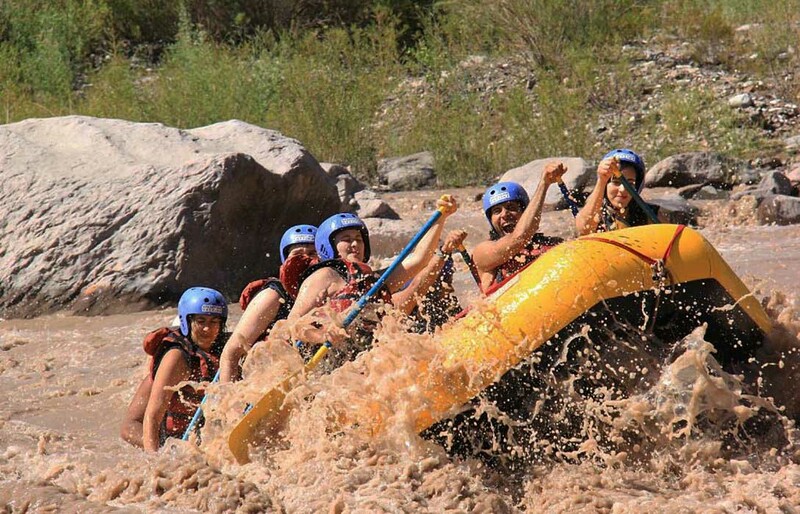 Our rafting adventure comes to an end with the knowledge and satisfaction of having conquered the mighty and foamy rapids of the Mendoza River! Important: This rafting tour lasts half a day. You can chill out and relax the other half of the day at our base, next to the Mendoza River, or you can combine this tour with one of these other half-day tours (which also start at our base): a trek and rappel tour, a half-day canopy / zip-lining tour, or a half-day mountain bike tour. Difficulty: moderate. 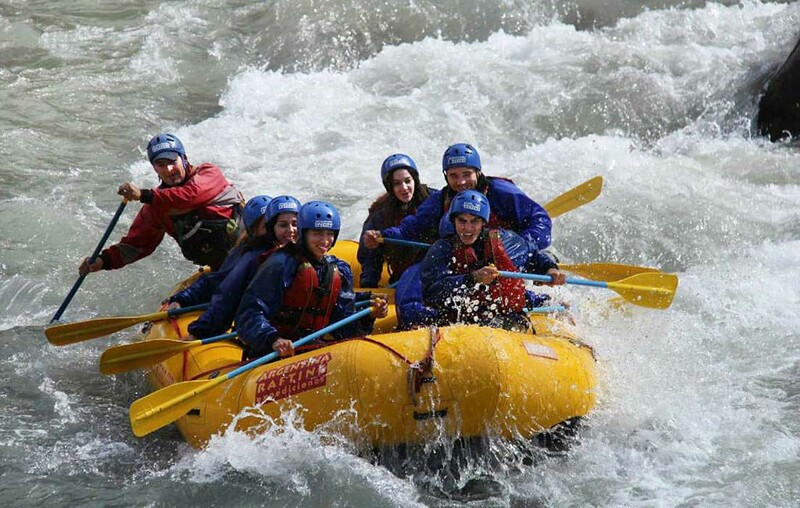 Depending on the time of the year and level of the river the rapids of this rafting can range from II+ to IV. The minimum age required for this tour is 12 years old. Duration: The tour has a half-day duration, and can be combined with another half-day tour starting at the same base. The return to the hotel is usually at the end of the day, regardless. Guide: group guide (only during the tour itself). No guide will be present during transfers from and to your hotel. The maximum group size for this tour is approximately 23 travelers (each raft holds a maximum of 8 to 10 travelers depending on the type of raft used). Vehicle: group vehicle (transfers to and from the tour base take a total of approximately 3 hours). Includes: rafting gear (waterproof jacket and pants, neoprene shoes, helmet, paddle, and life vest) and lunch (beverages not included).